Does your Shih Tzu seem to have an eye problem? Perhaps you are looking for a new dog, and like the look of a Shih Tzu, but have heard that they can develop eye problems? In actual fact there are some pretty common Shih Tzu eye problems and it is vital that as an owner, or potential owner, of the Shih Tzu breed you are aware of the problems that can occur. The Shih Tzu has been bred to have large eyes. The various kennel clubs encouraged this and yet although the large eyes may look cute they are often not as healthy as the dog’s eye should be. Take a look at some of the common Shih Tzu eye problems that the breed has to cope with. • The Shih Tzu is a dog that has been bred to have a Brachiocephalic skull. This means that his muzzle is short and his eyes large and rounded. The large appearance of the eye is actually due to shallow eye sockets rather than a bigger eyeball. This type of physical appearance in the dog can also cause an inability to completely close the eyelid around the eye. • Both of the above traits can lead to severe eye conditions such as infections and ulcers due to foreign bodies becoming trapped on the eye itself. Another problematic effect is the eyeball shifting position in the socket whereas if the socket were deeper this would not happen at all. Such a shift in position can cause muscle displacement and result in almost instant blindness. • The Shih Tzu can also suffer from eyelashes that do not sit naturally, causing continuous irritation as they grow into the eye itself or into an unnatural position away from the eye. • Finally this little dog can suffer from hereditary cataracts even when he is very young. 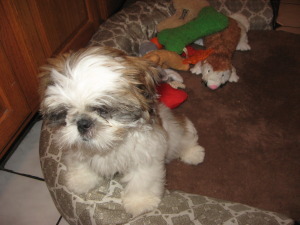 Eye problems are another reason to choose a careful and kind Shih Tzu breeder. Although some problems cannot be foreseen or avoided it is important that only the healthiest dogs are bred from to avoid making the problems more common. It is vital to keep the dog’s hair out of his eyes as this can be uncomfortable and cause irritation which will easily escalate into more serious eye problems. Keeping the eyes clear can be achieved by ensuring that the hair is regularly cut away from the eye area or tied back in a soft band. 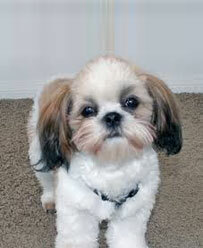 The Shih Tzu can develop a term called dry eye, particularly if his eyelids struggle to completely cover his eye. So it is vital to watch out for extra discharge, itching and scratching around the eye areas plus redness and soreness. A small amount of tear staining is normal in the Shih Tzu and, if the dog looks healthy otherwise, this is nothing to worry about. However if any of the above symptoms occur then it is time to visit your veterinary surgeon as Shih Tzu eye problems can be very serious indeed. Does your Shih Tzu seem to have an eye problem? Perhaps you are looking for a new dog, and like the look of a Shih Tzu, but have heard that they can develop eye problems?